The most powerful tropical storm of the year to date left a swathe of possibly long-term damage after killing more than 60 people in the Philippines and another four in China before weakening on Monday. In the Philippines, rescuers had found 11 bodies and are digging for dozens more in what the domestic media outlet Inquirer.net called a “massive mound of mud and debris” covering a chapel where the people had taken shelter Saturday as Typhoon Mangkhut blasted the northern end of Luzon Island. Mangkhut, a super-typhoon with winds of up to 250 kilometers per hour, went on to fell trees and hobble infrastructure in China’s densely populated Guangdong province. People’s livelihoods will take time to recover in the Philippines, while China faces widespread damage to infrastructure, people in the two countries said. “A lot of people not only lost their houses, but they also lost their livelihoods, so we have to come up with very quick opportunities to recover their livelihoods, otherwise we have a lot of people who would to be desperate to make three square meals a day,” Philippine senator and domestic Red Cross Chairman Richard Gordon said in a video from the relief agency. Rescuers search for people trapped in a landslide caused by Typhoon Mangkhut at a small-scale mining camp in Itogon, Benguet, in the Philippines, September 17, 2018. About 3 million people were affected in the worst-hit parts of the Philippines and another 11 million further south face flooding -- some from reservoir releases -- that may bar any return to their rice farms, Gordon said. Farmland damage will “exacerbate” concerns in the Southeast Asian country about a rice shortage, he said. An untold number of houses and schools were also damaged, often left without roofs in the disaster zone, according to local media reports. Agricultural damage is estimated at 14.27 billion pesos ($264 million), with 1.9 billion pesos of that in one province, Ilocos Norte. Illegal mining in the Philippines’ central mountain ranges, known as the Cordillera, may have weakened land in mountainous Benguet province where people are believed buried under mud, local media reports say. Philippine President Rodrigo Duterte said via the presidential website Monday it was time to “look into the perils” of mining. Four people died in China, the country’s official Xinhua News Agency reported. It said three were hit by falling trees and the fourth by construction equipment. Authorities had evacuated about 3.1 million people by late Sunday and closed 640 tourist spots, the news agency said. 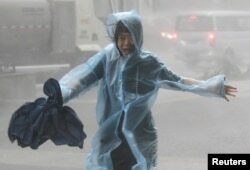 A woman runs in the rainstorm as Typhoon Mangkhut approaches, in Shenzhen, China, Sept. 16, 2018. Around the 14-million-plus city of Guangzhou Sunday, authorities stopped part of the metro line as trees crashed into streets and winds blew signage past storefronts where people huddled inside during the most severe six hours of the storm. The typhoon also smashed windows and knocked down building walls. Officials cancelled classes Monday in seven cities, including Guangzhou and the region’s high-tech center Shenzhen, Southern Metropolis Daily reported. High-speed rail and hundreds of flights were also cancelled or delayed. Nearly $80 million in insurance claims were filed Monday. The typhoon will probably leave lasting damage to infrastructure, farms, communication channels and public utilities, said Zhao Xijun, associate dean of the School of Finance at Renmin University of China. Guangdong’s Pearl River Delta is the country’s premier factory zone. “There’s still no exact, obvious figures for how big the losses are and how much we must pay in order to get back to the normal order of production,” Zhao said.